After months of planning, Shimmy Beach Club, Cape Town’s premier lifestyle venue, has announced that they have secured David Guetta’s label F*** Me I’m Famous! for their legendary NYE extravaganza this December. 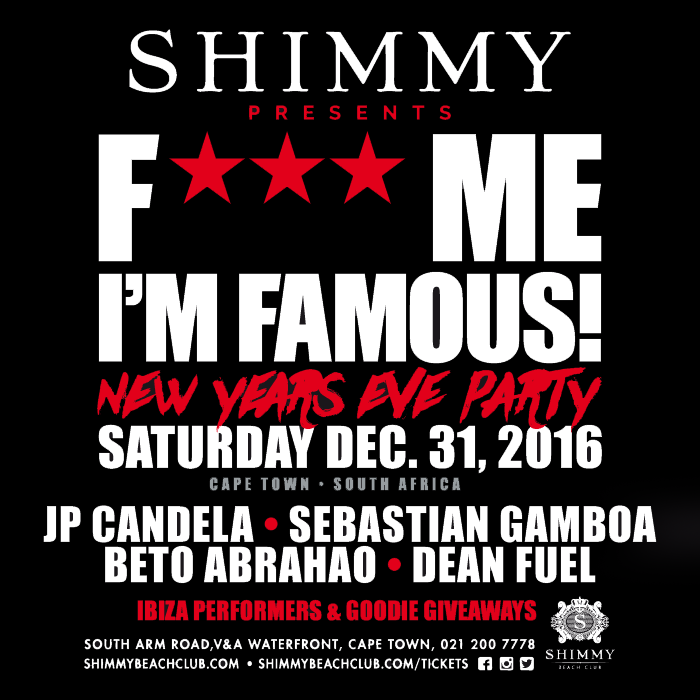 The ‘F*** Me I’m Famous!’ parties are famous throughout the world for over a decade and now Shimmy Beach Club hosts the first one in Africa, for one night only. The high profile Electronic Dance Music artists come hot off the Ibiza scene. If previous years were anything to go by, you can expect world-class style, glamour, music and entertainment in a 2016 finale that is set to rival all other New Year’s Eve celebrations in Cape Town. You don’t want to miss out. Limited Early Bird Tickets for Shimmy’s FMIF NYE are available online now at www.shimmybeachclub.co.za/tickets. Contact us on 021 200 7778 or email tickets@shimmybeachclub.co.za for more information. Follow the conversation at #ShimmyFMIF.